For years the first thing I thought about when I woke in the morning, the last thing on my mind at night and for most of the times in between was Mum. I first felt responsible for her when Dad died of Cancer in 1994. Mum was 58 and still working as a Hospice Nurse. She had been with Dad since she was 17 and they hardly ever spent a day apart. I couldn't begin to imagine how she would cope without him. At first it was just keeping her company and helping her manage her finances, something Dad had always done. I had recently divorced and had 2 young children so we all supported each other through the grief of losing Dad and us both living single lives again. The pattern was set and we became "Joined at the hip". Just before Mum was about to retire she suffered a heart attack. She was admitted to hospital and had stents fitted to widen her arteries. During her time in hospital she complained of headaches but was assured they were just a side effect of the heart drugs she was taking. We were worried about her as we couldn't face losing Mum so soon after Dad. My feeling of responsibility for her increased and it was months before I began to feel confident enough to leave her again. Fortunately she made a good recovery but was forced to leave work. Retirement meant that Mum could now spend half of the year in Australia with my brother and his family, but when she was in England she was always near me. I had moved to be near the wonderful new man in my life and Mum followed me to Somerset. She bought a flat that could be safely locked up when she was away and her life seemed all set for adventure. This was the pattern for the next few years until we could no longer pretend that the forgetfulness and anxiety were nothing to worry about. Eventually Mum was diagnosed with Vascular Dementia. The doctor told me, but only ever referred to "problems with your memory" when talking to Mum. No one explained what the prognosis was or what help was available. Being ever practical and having knowledge of the health system we managed ourselves for as long as possible. Mum moved to a retirement complex with a resident manager and 24 hour call system and I spent as many hours a day with her as I could. When I was away friends and relatives would fill to help us . Over the next few years as Mum's condition worsened she needed more and more of my time. When I wasn't with her I would phone constantly until she became too confused on the phone. Her neighbours were wonderful and kept an eye on her and she started to receive home care visits to ensure she had eaten and taken her medication. We plodded on together finding a way of coping with every new problem as it arose. There were good days and bad ones but we laughed our way through it whenever we could. Eventually we realised that we were reaching the point where Mum needed more care than I could manage without her living with me full time. I decided that it would be harder to try to care for her myself and fail than to make the move straight from her own home to a care home. I looked at several homes and was fortunate to find one just 5 minutes from me. Mum had a good pension and had a property to sell so we didn't need to wait for Social Services to approve or agree funding. All I needed was for them to have a room. The next few weeks became very difficult. 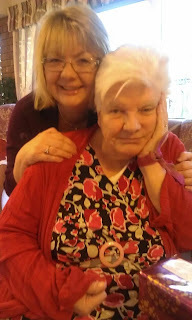 As Mum had Vascular Dementia there could be huge deterioration in her condition almost overnight. This happened just before a room became available. I will always remember the relief I felt when I had the call to say she could move in next week. I also remember the feelings of guilt and sadness the first time I left her. Luckily for all of us Mum's Care Home came to be her real HOME. The carers like extended family and I would happily spend hours at a time visiting everyone. It became like a second home for me and I grew to love many of the residents. I grieved with their families when they passed away and worried when they were ill or had to move to a nursing home. My biggest fear was that Mum would have to leave. At the end of 2012 Mum became very tired and breathless and we thought we were moving into yet another new phase. I began to spend even more time with her every day as I wasn't sure how much longer she would have. She passed away on 31/1/2013, very suddenly and before I could get to her yet I knew she was surrounded by carers who loved her. Once the funeral was over and my Australian family had returned home reality hit hard. What do I do with all the extra time in my day? How can I replace the hours spent with my lovely Mum in the home where she was so well cared for and loved? While Mum was at Critchill Court I decided I wanted to give something back so started fundraising to create a 1950's Memory Room for the residents to enjoy and a place to stimulate reminiscence. I am working with them to complete that project which will be named Gran Anne's Room in her memory. We plan to decorate and furnish the room in 1950s style and fill it with items to prompt memories. People have been very generous with their gifts of money and items. I also discovered Twitter. I had dabbled a bit but was really a Facebook addict, using it as a tool for staying in touch with my Aussie Relatives. Once I started to explore Twitter further I met some wonderful people all living with dementia themselves or caring for a loved one. I found Dementia Challengers www.dementiachallengers.com and others and have tried to support my new friends, most of whom I have never met. There are so many of us out there experiencing life on the rollercoaster that is Dementia. But the thing I am most proud of is helping my brother, John Belchamber, who has set up the Dementia Journeys website www.dementiajourneys.com to connect people from all over the world who are themselves on their own journey. Ours may be over but there is still so much to be done. John is the driving force behind this venture and Mum is our inspiration but if I can help others by sharing our experience I will, I hope, be finding a way of "Filling the hole at the end of our road".